If you are planning to go for wedding shopping in Shahpur Jat Market in Delhi, then you have to check out this Shahpur Jat designers list. You can be sure of finding the bridal outfit of your dreams here. Off lately, Shahpur Jat lehenga stores have been gaining popularity for wedding shopping in Delhi, and for all the right reasons. If Shahpur Jat wedding shopping is something that you are looking forward to, then scroll down and have a look at these Shahpur Jat boutiques where you can find everything from designer sarees and lehengas to anarkalis and gowns. At Madsam Tinzin you will find lehengas in silk fabrics with flattering and modern silhouettes. This designer boutique in Shahpur Jat aims to understand traditional embroidery techniques and bring out their grandeur through their bridal wear. And if you are looking for Shahpur Jat lehenga designers online, then you can check out Madsam Tinzin’s collection here! Store Timings: Monday - Saturday 11 a.m. to 7 p.m. This Shahpur Jat designer label mirrors the idea of blending rock glam vintage romance to design contemporary Indian bridal wear. So, if you are looking to shop for modern bridal lehengas in Shahpur Jat, 1600 A.D is the place to be. Store TiminDevanagariy - Saturday 10.30 a.m. to 7.30 p.m. Embodying the spirit of the modern Indian woman, Devnaagri is that designer boutique in Shahpur Jat where you will find some really amazing contemporary lehengas to wear on your wedding day. You can even check out their collection online here! Store Timings: Monday - Saturday 10 a.m. to 7 p.m.
Abhinav Mishra Shahpur Jat is one of those designer boutiques, where you will find a wide collection of glamorous Indian wear. This bridal lehenga store in Shahpur Jat is inspired by Indian art and architecture that is reflected in its beautiful lehenga textures and intricate embroideries. If you are looking out for Banarasi lehengas in Delhi, then this designer in Shahpur Jat is a must visit. Bageecha has a beautiful range of Banarasi lehengas, sarees and anarkalis that will blow your mind with its grace and beauty! Price range of lehengas starts at 45,000, shararas and anarkalis start at 40,000, while sarees start at 12,000. Among all the Shahpur Jat Designers, Christina WT is where you will find dreamy pastel lehengas with intricate and gorgeous motifs. 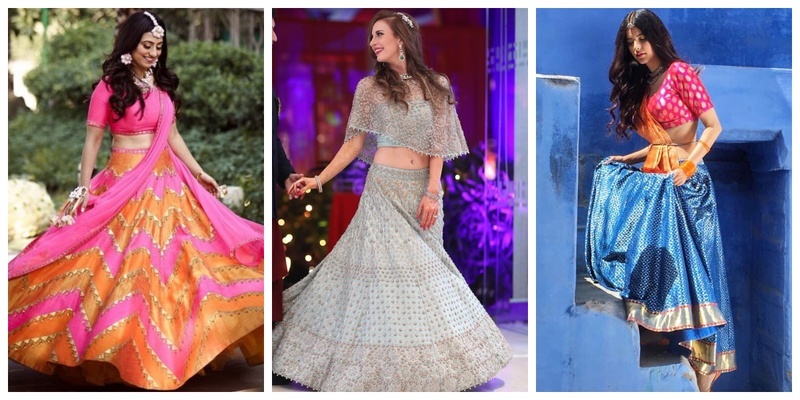 Christina WT bridal lehengas in Shahpur Jat are perfect for brides who are bored of reds and want to wear lighter and chirpy colours for their big day. Wedding lehengas and full-length Anarkali gowns at Christina WT start Rs.70,000 onwards. Store Timings: Monday - Sunday 10 a.m. to 7 p.m. If you are looking out for affordable boutiques in Shahpur Jat for your wedding, then Priyal Prakash is a place you should definitely head to. Her signature style is geometric patterns in bright and eye-popping colours. Highly recommended for brides who wish to wear a quirky lehenga for their wedding functions. Priyal Prakash lehenga price range starts at Rs. 40,000. Store Timings: Monday - Saturday 11 a.m. to 6 p.m.
Avnni Kapur label is one of those Shahpur Jat stores, where you can find ethereal pastel-coloured bridal wear in Delhi. Fun colours, intricate embroidery and beautiful textures make Avnni Kapur bridal lehenga truly contemporary and stylish. Price range starts at Rs. 35,000. Lehengas at Kalista feature modern printing techniques and have innovative silhouettes mixed with the best of artisanal embroideries. Kalista is one of those Shahpur Jat boutiques, where you can find bridal wear that stands out from the crowd. Their lehengas are priced anywhere between Rs. 25-50,000. Store Timings: Monday - Saturday 11 a.m. to 7.30p.m. Monika Nidhi is that Shahpur Jat designer boutique whose style can be best described as delicately offbeat. Their signature style is their pastel colour palette, which is seen across all their wedding outfits. Monika Nidhi is recommended for bride’s who want to buy trendy engagement or pre-wedding outfits with tassels, capes or off-shoulder blouses. The price range of designer wear at Monika Nidhi starts at Rs. 20,000. Which of these designer boutiques are you planning to visit in the Shahpur Jat Market for wedding shopping?